Regarding as a modern, flexible, extensible, cross-platform multimedia container format, MKV has been wildly used like downloading sites. But how to play MKV on iPhone? As known to all, Apple doesn't provide support for MKV format on any iOS devices. Well, you can simply apply a MKV to iPhone converter to complete the MKV to iPhone conversion, and then play it on your iPhone with ease. Being tested with more than 10,000 video files, Brorsoft Video Converter is assured of a stable, easy-to-use yet fast video converting tool on Windows and Mac. It is capable of converting SD/HD/4K videos, e.g. MKV to MP4, MKV to MOV, MKV to M4V, etc and transferring videos in any format to almost all portable devices, including latest released smartphones/tablets, such as iPhone X, iPhone 8 (Plus), iPhone 7 (Plus), iPhone SE/6s (Plus), iPad Pro, in only 3 steps. It is also a great 4K video converter enabling to convert 4K videos to general video formats and portable devices with optimized quality owing to High Quality Engine and Deinterlacing Engine. Packed with Super Transcoding Engine and Multi-core CPU utility, this best video converter can deliver 30x real time conversion speed. It also has ability to edit video by cropping, trimming, merging, and adding external subtitles. It supports more than 70 input formats and up to 250+ output file format. Supported output video and audio formats include MP4, MOV, WMV, AVI, XAVC, XAVC S, MPEG, VOB, TiVo recordings, MXF, MTS/M2TS, FLV, 3GP, 3G2, DivX, XviD, MP3, WMA, WAV, AAC, AC3, M4A and more. Brorsoft Video Converter supports 150+ presets for popular devices like the iPhone (including iPhone 6 Plus and iPhone 6), iPad, Android devices, Windows-based tablets and game console, etc. This video to devices converter will change video to the correct sizes and formats for your devices and other media players. It supports decoding Samsung camera H.265 and other H.265 source files for playing, editing and sharing, encode other files like H.264 to H.265 MP4/MKV for better streaming, playing and storage. Brorsoft Video Converter also comes with a built-in video editor, with which, you can personalize and retouch your videos in clicks. Trim video into smaller segments; brand your video by embedding a watermark; importing subtitle files in .srt or .sst format to convert with any format video files; Remove unwanted objects from video. With the new optimized acceleration technology, the super speed video conversion now is 30X faster than before and surpasses most regular video converters. Besides, it converts any video and audio formats with extremely high speed and at the same time it will not compress the output quality. Handbrake is available on different platforms, Windows and Mac included. It supports different formats and encoders including MKV, MP4(m4v), H.264(x264), H.265, MPEG-4 and MPEG-2 (libav). You can convert videos directly to iPhone, iPad, iPod, and other Android phones with the optimized presets. However, people should also know that Handbrake is relatively weak in stability and sometimes the process may break for some reason during the video conversion. Moreover, the novice users may be discouraged by the potentially confusing settings. See a tutorial on Handbrake failed to convert MKV files. 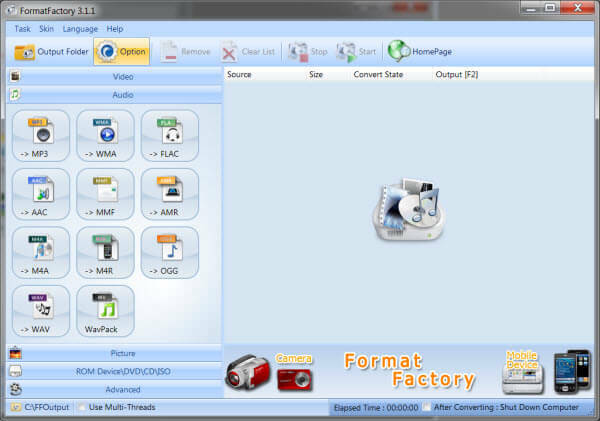 Format Factory is another free video converter for Windows. It mainly supports the MKV, MPG, MP4, MP3, AVI, 3GP, OGG, BMP, TIF, TGA, ICO, WMA, SWF, FLV, JPG, WMV and a whole lot more. It also works perfectly with iPod and iPhone formats and rips DVD. Apart from it, it is mainly available in 65 languages. However, to some advanced users who require more usages of a video converter, for example, the ability to create brand new videos, Format Factory could not give a hand. Aside from it, many users are frustrated by the frequent Format Factory not working issue, and the subtitle handling ability when they need to merge embed subtitles. If you are also one of them, you need to find an alternative to Format Factory. MPEG Streamclip is also included on the top 5 video converters for iPhone. It allows you to play and open most of the movie formats that include the MKV files. The formats can also be transported and edited with TRIM, PASTE, COPY and CUT. They can also be converted into a demuxed or muxed files and are exported to an AVI, MPEG-4, DV or QuickTime files with such a professional quality. Well, if you want an all-in-one video/audio converter, player, editor which is able to converting videos with faster speed and zero quality loss, A MPEG Streamclip Alternative should be take into your consideration. This video converter like all the above converters supports many video formats, MKV, AVI, MP4, iPod, PSP, 3GP (mobile phones), iPhone, WMV, ASF, MOV, QuickTime, MPEG, MPG2 etc. It lets you convert videos to your iPhone, TV, website, mobile phone, iPod, PSP, MP4 player and more with optimized presets. Also you can extract beautiful music from movies. Next time you decide to go out for a walk, don't forget to put MKV movies to an iPhone and enjoy them anywhere. What you need is just an easy-to-use MKV converter utility to change format in advance.